This old blue singer has been on display in my studio for over a year. I've been a bit intimidated by the motor's loud roar, so it sat idle on a shelf day after day. I'm also very attached to my younger and quieter sewing machine... but back in December, that trusty "new" Pfaff decided that it had seen one too many coffee sacks without a tune up- and quit. What poor timing. It was just the nudge I needed to finally dust off the Singer, put in a pair of ear plugs (just kidding! ), and give her a whirl. The manual helped me to adjust the tensions and understand a few quirks. I felt very resourceful and even a bit Fix It Friday-ish. I made a few simple projects, but honestly I just couldn't stop pining for my Pfaff... who was taking weeks and weeks to be repaired. I truly moped about my studio without her. I don't usually attach gender to inanimate objects, but sewing machines seem to be my exception. I've often thought of them as friends (or foes) and they are always feminine to me. My love for this particular sewing machine runs deeper than any other that has ever been in my life. A couple of days ago I got the call... she was ready to come home. I feel a bit silly sharing my elation, but it was similar to the reunion of a long lost friend. I even made calls to the important people in my life to announce her return. Please don't feel worried about my abandoning the little blue one.We're buddies now. I will be sure to bring her out to play more often, but... well- this photo speaks for itself! Mama Angel- Glad you were reunited with your machine and yes, a new appreciation! Heldin des Chaos- how wonderful and even logical, for that matter! I love the color of your machine -- happy you have her back! I did the happy dance when I got my sewing machine back from my Miracle Repair Man. I thought she was a goner but he brought her back to life. I've been sewing like crazy now that I have time after the holidays. Pretty blue machine. Love the photos of you and your machine. Sew, sew sew!!! happy sewing..don't you know that singer is happy too!!! I love your little blue Singer. It may feel silly to have such an affection for your newer machine, but I laughed a bit because ... I wrote an ode to an Elna last September. The link is - http://everythingssorandum.blogspot.com/2010/09/i-miss-you-sweet-elna-letter-to-my.html if you want to read about "her." The blue Singer is so pretty but I can see the excitement in the last picture which I love. Oh man, I feel the same way about my machine. When she first came to live with me, in my bedroom, I would wake in the night and there she would be...lovely in silouette. I would sigh and go back to sleep. All is well in the world when one's sewing machine is near and healthy! Great post! My mom has a Pfaff that she enjoys,too. Too cute... I love my girl too :) I totally understand! I think it's kind of fantastic that you feel that strongly about a useful object of any kind! I think the most important things have spirits. And that last photo of you is delightful--and with your cute Reinvention Skirt peeking out from your coat too! Yes, yes, certain inanimate objects DO evoke this kind of love, I get that! I am very lucky in that my FIL is the most trusted sewing machine repairman in this area. As long as I can get into his queue I -- and my "girls" -- are always well cared for. I'm so glad your young friend is all patched up and ready to work side-by-side with you once again. I think your trusty blue Singer friend has aged gracefully! I just got a new machine. I hope I love it as much as you love yours! The purchase was a long time coming: I was in denial for several months, and I was very pleased with the loaner I had in the interim--a 1930's Singer with the ol' knee pedal. http://ny-image3.etsy.com/il_570xN.184069795.jpg My professor bought it in the 60's when she graduated, and it still runs like a dream. But she did want it back...I guess we all get attached to our girls! came here today via ELK. what a cute post. I love old sewing machines. 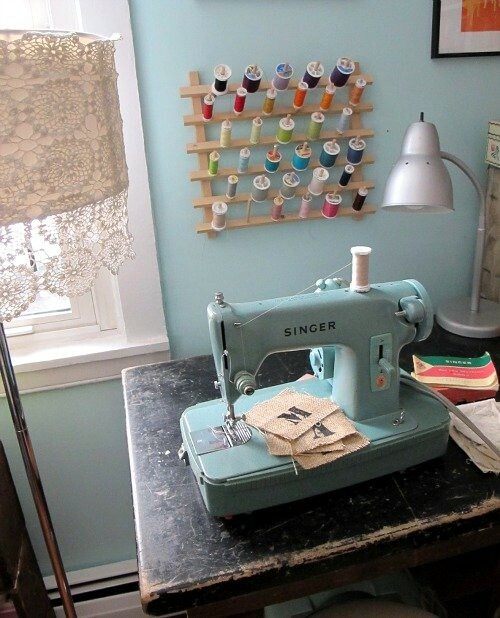 I just recently got an old turquoise-colored White sewing machine. and my favorite machine to use is my moms old singer. very heavy though. i dropped that same sewing machine in that same case on my toe. broke it and cried for days. that is one heavy sewing machine. I don't know what I would do with out my sewing machine!!! I love your lacy lampshade cover. How did you make it? Ka-pow I'm not sure, but I think it's younger than I thought. I looked for a date on the manual and it says 1963 for this model which is a 285J. Good luck researching it, it's a wonderful treasure to have along with your memories of her. Love it! I have the same machine :) Could you post the serial number and all that fun technical stuff? Mine does not have any information on it beyond the voltage, and of course I dont have the manual. I'd really appreciate it. Thank you! !